Use the above Online Enrollment opton to enroll now. The mission of Jefferson High School, as the leading alternative high school of Siskiyou County, is to assist students in accomplishing their educational goals and prepare them to lead productive and healthy lives through flexible individualized instruction in a safe and positive school environment. When winter approaches please remember to check local radio stations if you have questions regarding a school closure or late start. You can tune into FM 103.9, 102.3 or 97.3 for updates. Siskiyou Union High School District has launched communication system. We will be able to contact you through a cell call, text and email. Please make sure your information is updated. We will also be contacting you at the end of the day regarding your student's absences. Please call 530 926-0425 if you have any questions. Health News from Patty Morris R.N. 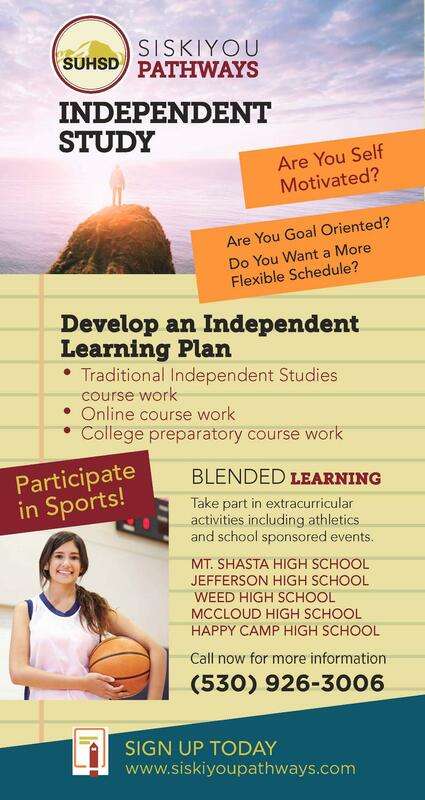 Siskiyou Adult School is for those students 18 & over looking to complete their high school education. Adult School starts Wednesday August 31st.